Since I published my post about the Epiphone Wilshire, I've been meaning to write a follow up with more great vintage Epiphone models using examples found on eBay. So here we go! the oval markers on the neck (also a change which happened in 61) - note that there is no marker after the 15th fret. You're on your own for high-pitch solos! This could be yours for $4,500 (buy now option). Going from solid body to semi-hollow (Epiphone's historical forte), the fairest of them all: the Casino! What better claim to iconic guitar status than being the guitar in the hands of John Lennon for the Beatles famous last show on the rooftop of the Apple building. McCartney was actually the first Beatles to buy one -Lennon and Harrison followed shortly thereafter. And added bonus on this vintage: the cracks on the finish! This one is "just" $3,850 (buy it now too). can you believe this vintage guitar has been through half a century? It looks new! This one was for sell at $4,500 but just got delisted by its vendor. And that's it for now for vintage Epiphones. I'd love to get your comments below or on twitter. I didn't post about the Les Paul 54 Oxblood Inspired By Jeff Beck model when it was first announced by the Gibson Custom Shop. But today, I just realized that GuitarCenter.com was selling a signed aged version for a mind blowing $25,000! Ok, Beck's 54 Les Paul is a unique model just for its story before and with Beck. And sure, the specs are very specific as a result: a 54 Les Paul routed for humbuckers with two refinish ending in a peculiar color. So, of course, when the Custom Shop decides to build a few replicas (150) of this unique model, these are going to be unique guitars. And then pick a few (50, pictured left) to be aged by Gibson master luthiers to look exactly like the real one. And then get those signed and played by Beck, a living guitar icon. That's huge. But is it worth $25k? Can anyone afford this in this economy? Probably not as many as expected - as staggering as this price is, this is indicated as a price drop on GC's site. If you really like this guitar but don't have this budget, you still have options: GuitarCenter.com still lists the non-signed non-aged version of this Les Paul Oxblood by the Custom Shop. The price tag is $7,000. And if that is still too high, you can go with a previous re-issue by the Gibson Custom Shop. You can find those on eBay between $2,750 and $4,000 (as of writing). Note that these seem to be chambered Les Paul's. See below for current search results. A beautiful vintage 1966 Gibson ES175 is up for grabs on eBay. Reserve has not been met yet (at USD1,525 as of writing) but so far it is a decent price. I especially love the color of this guitar. The sunburst has been extremely well done, to my taste. The trapeze tailpiece adds a lot of charm too. And I really like the florentine cutaway - a shape that has grown on me since I posted about the Gibson limited run series Les Paul florentine. This is a '66 model, so featuring two humbuckers. 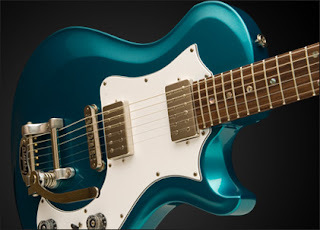 When the ES 175 first launched, in 1949, it had only one single-coil P-90. Starting in 53, it featured two P90's (see some more on eBay). And it's in 1957 that Gibson switched the 175 to a 2-humbucker configuration, like the model at hand. It probably makes sense to bid on this one up to $3,500 since it is in good condition and the Custom Shop ES175 re-issue sells north of $3,800 . Funnily, the denomination 175 came from the original price tag of the first ES, which was $175.00. Iconic Fender Crashocaster on eBay -own one like Clapton! It's all in the pic on the left. Look! Says the posting: "This is a unique guitar commissioned for a special project for a National Association of Music Manufacturers (NAMM) Festival. The artist combined for the first time canvas art and guitar and amp art and was thrilled with the results. It became one of his coolest and most favored pieces." Hefty price tag on this Fender Masterbuilt Stratocaster: Buy it now at $24,000. But this is your chance to get a pretty unique piece of contemporary art and a guitar like Eric Clapton! Although the whole piece would make the coolest guitar wall ever, this particular design on the guitar doesn't work for me. So, maybe you want to order your own direct from the artist (see this site: Crashocasters.com). Or get a Fender CS Eric Clapton Strat' and a few spray cans and get creative! My favorite Crashocaster designed for Clapton is the one he plays below. I think he used that one for the show in honor of his late friend Beatles George Harrison. He sure played it for the Queen Golden Jubilee (video). If you like crazy designs on a Strat', take a look at the Fender Splatter! he is now regarded as a pioneer of the Graffiti art movement. His work is said to convey a "visual link between street life and established society". By the 1980s Matos had exhibits across the United States and abroad. He was given his first gallery showing by Sidney Janis at the Sidney Janis Gallery in 1983. In 1996, Crash painted an Eric Clapton Signature Stratocaster and gave it to the artist as a gift. 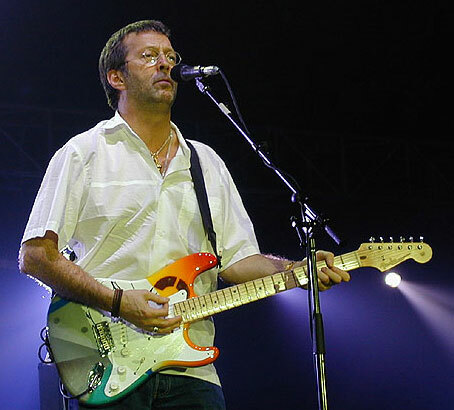 Clapton went on to use the specially designed guitar through his 2001 tour and later appeared with another. In total Crash has created 5 guitars for Clapton, though only three of them have made public appearances. One of Clapton's "Crashocasters" (nicknamed by Eric's guitar tech, Lee Dickson) auctioned for $321,100(USD) b y the name of "Crash-3" and was used extensively during the first Crossroads Guitar Festival in 2004. Soon after Fender Musical Instruments commissioned the creation of 50 such graffiti designed guitars from Crash and named the line "Crashocasters." UPDATE: the auctions for the guitars described below have now closed. But browse more vintage Guild Starfire on eBay now! 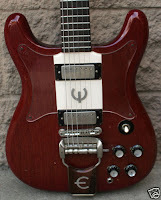 And then I stumbled upon two nice 60's vintage Guild Starfire guitars on eBay. Rewind. I was looking around for guitars a bit different tonight. And so I went on eBay and decided to stay away from my usual searches for Gibson and Fender vintage - no, they don't have the exclusivity for iconic guitars. So I typed Guild, which to me is like the sure thing to bring hidden jewels. now on sell on eBay). is a florentine single cutaway. It is a beauty in its red finish (esp. in its blue case). I think it has two P90's (feel free to comment below). It has seen better days (a few serious repairs: headstock and jack output). It has no pickguard. Starfire III's are definitevely iconic: it was Jerry Garcia's main guitar on the first Grateful Dead record. is a double cutaway in the vein of an ES335 with some unique variations: the futuristic/cubist pickguard shape, the jack output on the side not the face of the guitar, position of the switches. This one has 2 humbuckers for sure by the look of it. Blues legend Lightnin' Hopkins was playing one when going electric. So much for claim to iconic guitar status! These two Starfire's come in red (apparently likely refinishes), with bigsby-type tailpiece. While both are probably not a collector's dream because of the repairs, refinishes and changes (bigsby tremolo, grover tuners), they are probably very nice players. These are 40-year old guitars of good craftmanship so I have no doubt that these Starfire would deliver a nice vintage tone with that 60's vibe (and maybe with some tune up). Now for something different: Batson Guitars! I just discovered Batson Guitars thanks to them following me on Twitter. They have a very nice website which reflects their love and ingenuity when it comes to guitar building. I especially liked the part about the woods. Batson Guitars are acoustics and I know more about electric guitars as you might have figured from previous posts.That being said, I really liked some innovations like the soundport which is the whole moved to the side of the guitar on the ground that "since the soundboard of a guitar is like the head on a drum, why would you cut a hole in it?". Another innovation is the Shortail tailpiece which is located on the edge of the body with the same spirit of preserving the movement, vibrations and resonance. I have not been able to test one of those but I definitely will if I am near one of their distributors (a selected few so far). These custom guitars start around $5,000. Make sure to check out their site and their guitars if given the chance (and let me know!). Also, more nice Batson guitars photos here (source of pic above). UPDATE: the guys at Batson just let me know that they started a demo program (for $300 they send you a demo guitar to try out for 3 days) and some more Batson guitars photos. Anvil is the new Spinal Tap - only real! I think this thing is becoming a viral phenomenon but it seems so great: 80's metal band Anvil is featured in a documentary that follows them being reunited and touring. The parallel with the fake "rockumentary" on Spinal Tap is evident but it is a true story -at least as far as modern documentaries go. Anyway, check it out. Now waiting for the movie release and the Guitar Hero: Anvil version. I followed the final of "Idol" last week (as I mentioned here and here) and I really liked the Gibson Hummingbird that winner Kris Allen was playing. Its heritage cherry sunburst finish looked all beautiful and natural under the spotlights. Clearly it was blending and reinforcing Kris' low key performance, a stark contrast to Adam Lambert's over-the-top show with Kiss and Gene Simmons' axe bass. It's not often I write about acoustic guitars here but this is a nice opportunity to mention the Hummingbird. Yesterday, I started a short series of posts on guitars/guitarists guest starring on American Idol Season 8, following the final. Part I is here. Now to part II. Carlos Santana was invited to play some of his most well known melodies with all this season's contestants dancing and singing around (very kindergarten...). He was of course playing his Paul Reed Smith signature model which is a nice guitar but...I am so not into PRS guitars. I have actually never played one. Probably my loss but I have never been drawn to these when visiting guitar shops. Anyway, see Santana playing Idol, I actually visited the PRS Guitars site FOR THE FIRST TIME IN MY LIFE. Quite a feat! I probably go once a day to the Gibson site (for this blog but also because I receive their newsletter) and at least once a week to the Fender site (they don't do such a good job at adding content and sending interesting emails). So, there I was on the PRS site, browsing their news, when I noticed this awesome guitar which really caught my eye! Announcing the Release of New Metallic Finishes Featuring DuPont Hot Hues™, there is the PRS Starla in “Catalina Dream” metallic blue. What a stunner! With its modern retro / 50's blue, its white pickguard, its Bigsby tremolo, and it's big yet sophisticated single-cutaway body with a quite original carved top! Now, I want one. It might be a while before I get one though since current Paul Reed Smith Starla models sell new for $2,000 and up . Maybe I'll go and try one this week end since there are coupons and bargains out there. So, well done Santana and PRS for being on Idol! I like a good deal when a see one. Even better when they come with friends. A Memorial Day Week end Sales Event - 15% off coupon! Even if you are not in the market for a new guitar, it can be a good time to upgrade your pickups to DiMarzio, refill and stock on your Ernie Ball Regular Slinky strings, treat your bass to a Gallien-Krueger, add a Tascam to your home studio, or just show off in a Gretsch or Bigsby t-shirt. B.C. Rich Classic Deluxe Eagle Electric Guitar Dragons Blood below at less than $750! In any case, I think it is worth checking GuitarCenter.com or walking in a store this week end! I only really watched two episodes of American Idol Season 8, including the final yesterday. This still got me to start a short series of posts on guitars/guitarists guest starring on the show. First, like probably everybody else watching yesterday, I was surprised that underdog Kris Allen won over Adam Lambert who seemed untouchable (even Google predicted wrong!). Paul Stanley shirtless at 57 is probably the scariest thing Kiss has done on stage in their whole career. That alone must have got all the teenage drama queens and soccer moms to vote twice for Kriss Allen. Oh, Paul: you're not the starchild anymore and this was lame guitar crashing (did your tech unscrew the neck?). Back to talking guitars, is it possible that Lambert got axed....because of Gene Simmons' Axe bass guitar? I am always surprised by these weird custom instruments and I did some research. This Axe bass in its original form is actually as rare as it is lacking good taste. Interestingly, it was made by Kramer in the 70's with those looked after aluminum necks that were Kramer's trademark. The Gene Simmons Axe came in limited numbers and consisted of a guitar and a bass. The Axe was, well...an old English Executioner styled axe! Both the guitar and bass had a single pickup, 1 vol, and 1 tone. Simmons signed a number of them. (...) It's estimated that there are less than 500 out there. The guitar is actually quite more uncommon than the bass. The Gene Simmons axes only lasted a year and are highly collectible. There are many models out there that claim to be original, but the truth is, if they aren't signed by Gene, then they aren't legit. Additionally, the signature needs to be sealed under the clearcoat in order for to be original. Funnily, doing my research I also found this VH1's Rock Honors Kiss video of Scott Ian playing such an axe in a supergroup made of Slash, Tommy Lee and Ace Frehley fronted by Rob Zombie. Definitely NOT my cup of tea... but hell, I'm blogging about American Idol, so what the heck! OR... you can have a look at my selection of really awesome guitars by the Gibson Custom Shop. I didn't know Joe Perry's main guitar nowadays (not sure if anyone is trying to keep count) is a Gibson BB King Lucille -with a few modifications. Readers of this blog know that the Gibson Custom B.B. King Lucille is on my list of iconic guitars by the Gibson Custom Shop. Perry's Lucille is called Billie after his wife whose portrait is painted on the guitar. I'd say it's tacky and not very Rock n' Roll. But that doesn't surprise me from Aerosmith and its lead guitarist -they haven't produced great material (musical or else) since the 70's with the exception of Get a Grip in the 90's. Painting and naming a guitar after your love interest. What do you think? Good? Bad? Nice? Second-hand leather motorist grade? Leave a comment below! In case you too want to airbrush your significant other on top of a Lucille, check out those eBay listings. Careful though, some of those guitars have been signed by the King of Blues himself - maybe you don't want to paint over that! the Gibson Les Paul Standard Traditional Pro in Vintage Sunburst. Like the limited series Florentine, it comes in this nice vintage sunburst color (ebony and cherry sunburst are also available). The Std Traditional Pro's set up is a bit different but I like it all the same. The neck is a 60's profile so it is slimmer than my dream guitar (the '58 re-issue). But I'm ok giving up a bit of the sound for more playability. This is one difference with the Florentine which has an asymmetrical profiled neck. Another difference is of course the absence of bigsby. This is a LP Standard so classic Tune-O-Matic with stopbar tailpiece. Final point, the Les Paul Standard Traditional Pro comes plecked! * So the action must be awesomely flawless. Now for the price, this Les Paul comes at a reasonable $2,000. That's cheaper than the Florentine - but it's not a limited series. Shipping is free at GuitarCenter.com this week so you should definitely order this baby now if you dig it as much as I do. The Les Paul Traditional is the first model from Gibson USA to utilize the revolutionary Plek machine in setting up the guitar. The Plek is a German-made, computer-controlled machine that carefully measures each fret, along with the fingerboard height under each string, and then automatically dresses each fret, virtually eliminating string buzz and greatly improving the overall playability of the guitar. This pioneering process does in minutes what it takes a luthier several hours—sometimes even days—to accomplish. Every fret is accurately aligned, and the guitar is properly intonated, leaving the instrument "Plek'd" and amazingly playable. Maybe you should check you credit before you go and buy this guitar? Fantastic! The Gibson Les Paul Florentine with Bigsby has just been announced as the new issue in the Limited Run Series. What a guitar! It seems Gibson got the message loud and clear about other models in the Limited Run not striking a chord with its fan base (puns intended). I had mixed views about the Tribal V, the Tribal Explorer and the Eye. Gibson fans elsewhere (and especially on Gibson.com forums) have been much more vocal and far less polite, especially about the Eye. The classic Custom Black Beauty's bigsby vibrato tailpiece. The Standard's burst which reminds me of this killer honeyburst Les Paul Slash plays in November Rain. The particular tuners that you'd find on a lot of 70's Les Paul Deluxe (like my '77 Goldtop or this '78 redwine I covered a while ago). Then it brings the florentine cutaway to the Les Paul, a crossover from the ES world and a very nice design touch. Don't you think that this pointy horn and the Bigsby give this guitar a mean look? And according to Gibson, "the Florentine Cutaway design comfortably enhances a player’s reach to the higher register of notes" - if true, it's even meaner I guess! The body? "solid mahogany back topped by a AA-grade maple top with single-ply antique crème binding, smoothed with Gibson’s classic Vintage Sunburst finish." The neck? Mahogany with Gibson’s new asymmetrical profile and rosewood fingerboard. The pickups? A pair of Gibson’s renowned BurstBucker Pro offering "slightly higher output and allow amps to achieve a more natural break-up. They are packed with asymmetrical coils - true to Gibson’s original PAFs "
I am not ready to part with any of my expensive guitars now and I don't have the cash for this , but this expensive beast ($4,442 MSRP, $2,646 at Guitar Center) is one mean Les Paul I'd love to add to my collection - as a player and as a collector. Just spotted: this amazing vintage 12-string Electric XII guitar . It is sold by an eBayer with serious tenure and feedback so I feel he can be trusted when he claims that this gutar comes from the closets of the "Plant Records of Sausalito recording studio, aka The Plant". At roughly $3,600 as of writing, it is worth considering. There is a trade-off between this Electric XII guitar being not 100% original and quite worn and this guitar having some History (maybe on your favorite LP or song). BODY: Standard FENDER ALDER with 3 Shade SUNBURST finish-played to perfection. NECK. Stock FENDER neck with small frets with Brazilian Rosewood FRETBOARD. TUNERS: The original FENDER tuners have been replaced with GROVE MINI ROTOMATIC which increase the playability, tuning, and performance of this guitar tremendously. SWITCH: Stock 4 way rotary. PICKUPS: Has two (2) STOCK FENDER pickups. CASE IS INCLUDED WHICH IS NOT ORIGINAL FENDER CASE FOR THIS GUITAR. The cosmetic condition is GOOD . There are MANY nicks, scratches, and scrapes on it. I originally posted here about a Fender Katana from 1985 which is no longer auctioned on eBay. I think the Katana is a nice piece of Fender history so just wanted to update this post. The Katana is an attempt by Fender in the 80's to create a guitar that could speak to the hard rock crowd and compete with the Jackson's and Gibson Flying V's. Funny idea when you think that so much headbanging music has been made with good old Fender strats (Iron Maiden comes to mind). Built in 1986, made in Japan and cost £495 when new (...) - not a commercial success but rare and seriously underrated. The Katana is a cheap vintage piece of Fender history. You can probably grab a Katana on eBay for around or under $500 . At that price I'd go for it just for the fun of owning an odd guitar (with good craftsmanship).